As we learned in our Till Management Guide, a till is a cash drawer assigned to an employee to perform cash operations for your business. The Management Console helps you track and manage cash flow through the business, but the cash operations are performed on the POS. Depending on the settings configured on the Management Console, tills can either be set when the employee logs into the POS (by prompt), or by tapping the Tills option on the dashboard. Note: Depending on the settings you've enabled in the Management Console, employees will either be able to access tills with or without a password. To learn more, see our article Till Management Guide. For the purposes of this article, we will show accessing tills without a password prompt. Once a till has been set, users can access their till by tapping the Tills button in the Operations section on the dashboard. 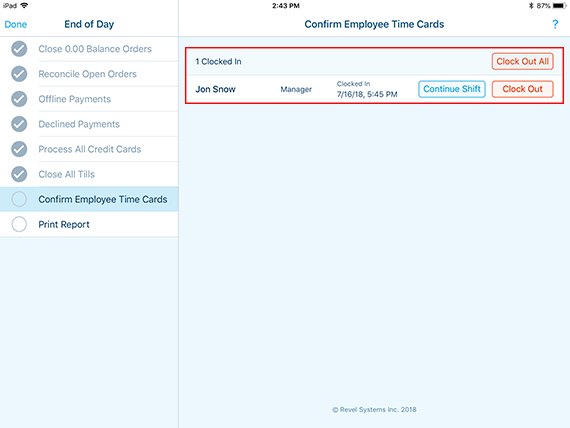 They will see a Till Management window similar to the one shown in the image below. 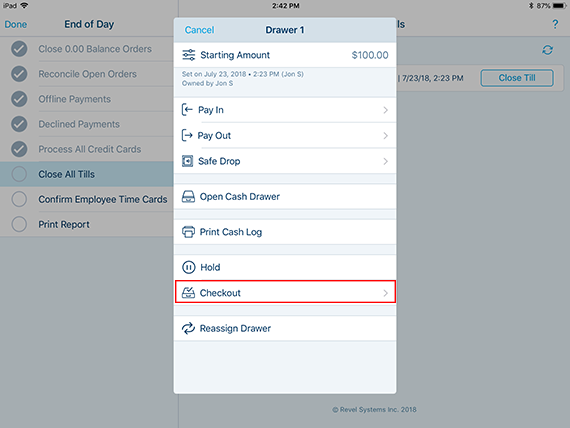 This window will display the date and time that the till was set, the amount of money currently in that till, and have options for the user to close out their till. Pay-ins and pay-outs are a means of adding and removing money from tills outside of cash transactions, so that it can be tracked in reporting. 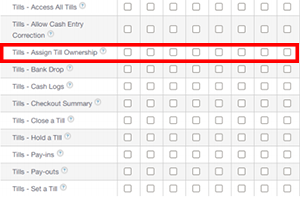 Lastly, click the Submit button to complete your Pay-Out or Pay-In. You will be directed back to the function menu for your till. Depending on your business, you can require Safe Drops at regular intervals, a certain dollar amount in the till, or in your End-of-Day process. These settings can be edited and enabled within your Management Console. Tapping the Print Safe Drop button will print out a log of the entered safe drop amount from the receipt printer. This can be used for any desired logging outside of the Revel System. Tapping the Print Empty Safe Drop button will print out a blank safe drop log from the receipt printer, to be used for manual entry of any safe drops. 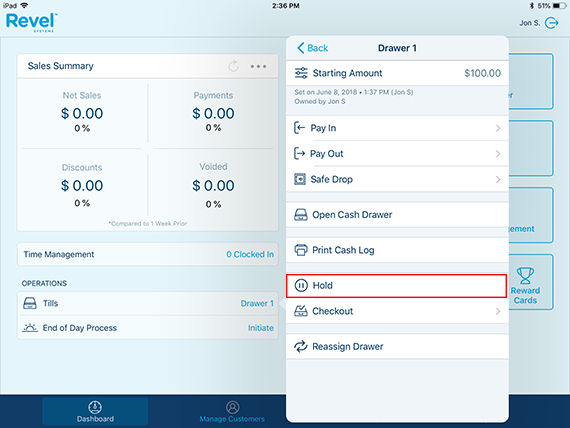 If an employee or manager needs to open the cash drawer for the till, Revel profides a one button solution to open the drawer. Users can access the “Hold Till” function when they want to count and clear the cash out of a till while still completing cash transactions on that POS station. In most cases, the first till will be held and removed from the cash drawer, and a second till will be placed into the cash drawer and set on the POS station. The first till will be counted and clear, and then closed on the POS station. Once a till has been held, it can be accessed by performing step one. Note: Once a till is marked on hold, you can access it, but once it is on hold it will stay that way until it is closed out. If you need to take a payment other than cash, you will have to open a new till. 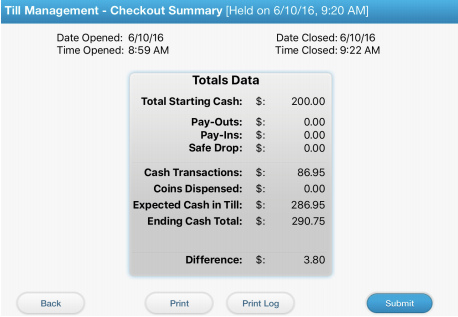 An employee can print a cash log showing all transactions from their till. This may be used for security purposes, requiring that a manager will set the till for all employees. Now the till is assigned to the employee you selected. Note: If the Track coins in tills option is enabled in the Tills settings on the Management Console, the Coin Type button will appear on the Checkout screen. Tapping this button will bring up a list of fields of the configured coin type values. The user can enter the amount of each coin in the corresponding fields. 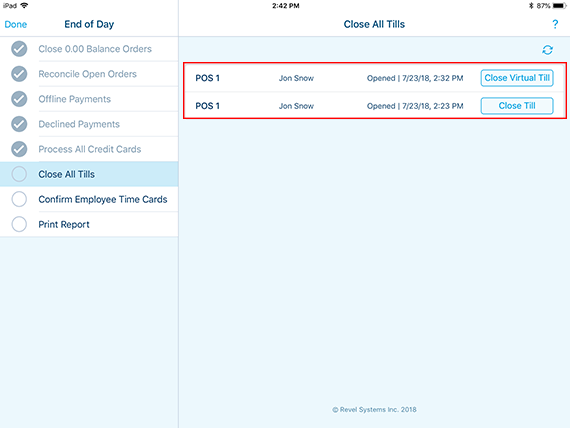 Tills can be closed by employees with manager role permission on the POS by running the End-of-Day Process wizard. 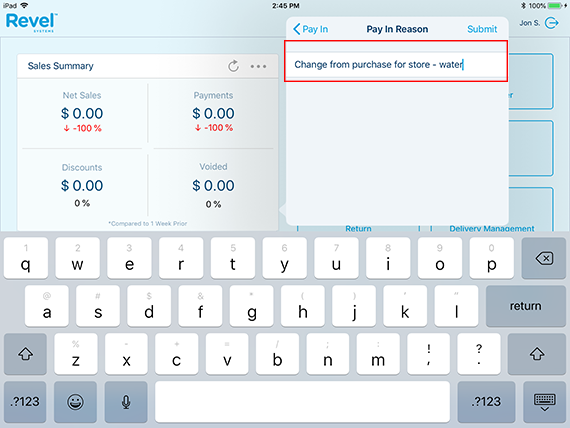 Tapping the “Close Virtual Till / Close Till” button for that till will initiate the till checkout process. After checking out the till, the user will be shown a Checkout Summary screen for that till.